The International New York Times reports[i] Cabo is developing as a high-end luxury destination rivaling Hawaii and the Caribbean for second-home buyers. Numerous master planned communities are currently under construction with several others in development. Names associated with the finest of luxury including, Four Seasons Resorts, Ritz-Carlton and Nobu are underway at various stages of completion. According to the Times report, new buyers are attracted to the healthy, outdoor lifestyle including, golf, scuba diving, kayaking, mountain biking, paddle boarding and the like. “The healthy lifestyle is more important than the Cabo of the ‘90s, when people sat around the pool and drank margaritas all day,” states Mark Cooley, a partner in the development of Chileno Bay Resort and Residences, a 22-acre community featuring an Auberge Resorts hotel. Just down the coast, Ohana Real Estate Investors are completing development of the original Twin Dolphin property, purchased in 2004 following the global market crash. 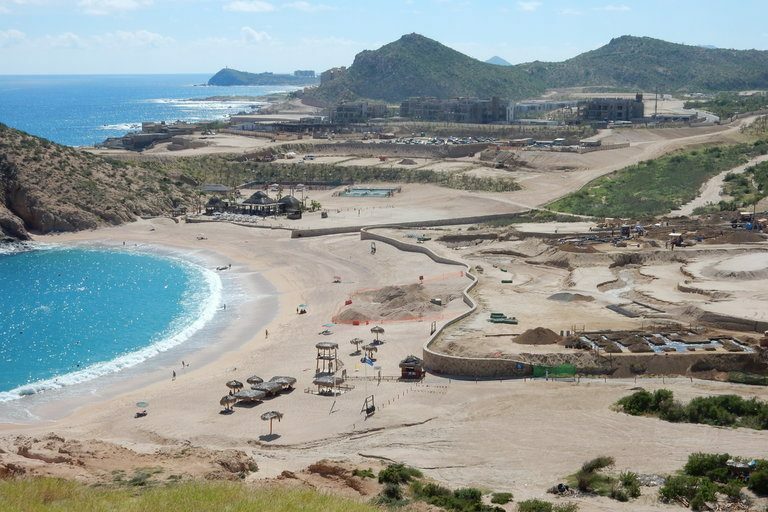 Within close proximity, construction is half finished on the new homes and villas at Maravilla Los Cabos and adjacent to where a new luxury hotel and private residences operated by Montage, is scheduled to open in 2018. Prices for single family homes in the new developments are typically priced starting above $2 million. According to Neil Johnson, director of residential real estate for the Ohana Investors, most buyers are Americans taking advantage of the ability to fly to Cabo in three hours or less, many arriving by private jet. “Buyers tend to be “family-oriented,” arrive by private jet and have little interest in decorating. The majority of people buying want turnkey, furnished, ready to go,” said Johnson. Despite the new development, the Baja lifestyle from the Cabo of the past can still be found. Its sister city, San José del Cabo, offers a quieter, more traditional colonial environment. And within a 30-minute drive either direction, empty sandy beaches stretch for as far as the eye can see. Whether you prefer the luxury lifestyle of the private developments, or the barefoot palapa bar and a hammock on the terrace, your tropical paradise is still Los Cabos. [i] Brass, K. (2016 Dec. 3). More Development Comes to Southern Baja California Coastline, The International New York Times, p. A 19.